Former President Pranab Mukherjee on Thursday, was in Nagpur to address the RSS cadre on the occasion of the final leg of three-year training programme called the ‘Tritiya Varsh Varg’. While the Congress party has already displayed immense displeasure at Pranab Mukherjee’s presence at Nagpur, the “liberals” and “journalists” who talk constantly about freedom of expression, democratic values and the virtue of neutrality experienced a Twitter meltdown. The meltdown, however, was not just limited to Twitter as channels like NDTV also threw editorial caution to the wind. While op-eds starting pouring in, some talking about how Pranab Mukherjee had delivered a fictitious blow to RSS and others talking about the usual humbug of RSS being fascist, NDTV ran an opinion piece by Congress leader Mani Shankar Aiyar, who has often been caught making condescending, ludicrous and anti-India statements. 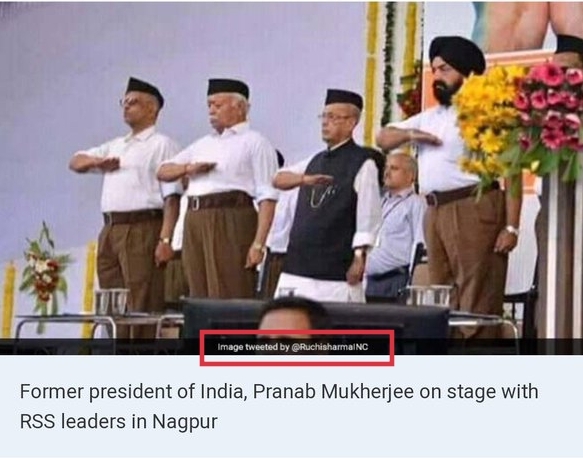 While the contents of the article were nothing novel and consisted of the usual drone, what was interesting is that NDTV decided to publish that article with a morphed, fake picture of former President Pranab Mukherjee at the RSS event. In the real picture, one can see that Pranab Mukherjee is neither wearing the black cap or doing the RSS salute. NDTV, in the fake picture they used, mentioned who they had sourced the picture from. When one visits the Twitter handle mentioned, one realises that @RuchirSharmaINC is a Congress IT Cell member who is also the Vice President of Haryana Pradesh Mahila Congress and Haryana IT Cell’s state in charge. It is amusing to note that even Ruchi Sharma had shared the pic calling it ‘fake’ yet NDTV thought to carry it without clarifying that it was fake or cross-checking whether the image being used was authentic or not. NDTV has, however, now changed the picture. While nobody expects great editorial standards from NDTV, which has often been caught lying and twisting facts to suit their own agenda, one can at least expect the channel to confirm such basic facts.